Remember when lobbies were nothing but a row of boring chairs, one corner table and a pile of ragged magazines? Maybe you’ve seen a few holdovers from that era, but today, most businesses put a little more effort into creating comfortable and welcoming waiting areas. Read on to learn how a comfortable lobby can make a great first impression with customers. The reception area is supposed to be welcoming, but many businesses make the mistake of having their reception desk behind sliding glass doors, which creates an instant barrier for the customer. While you should ensure the security of your receptionist, you can do so without making your customer feel unwelcome. Good reception area design should include a desk area that’s mostly open. And good security begins at the exterior door to your company. You can install an intercom system so visitors must be “buzzed-in” the front doors, but after that point, security measures should be largely unnoticed by visitors. Many security systems are available that allow front desk staff to sound a silent alarm or lock doors with the push of a button. Some businesses may hesitate to choose art for their lobbies, worrying they may pick something customers object to, and that’s why you see so many bland wall hangings in offices. But is “ordinary and uninspiring” the right message to convey about your company? Art can mean anything – attractive mid-century modern furniture, indoor waterfalls, a colorful blown-glass lighting fixture – so don’t get too hung up on the idea that “art” must be displayed on walls. Fluorescent tube lighting is about the most unflattering light one can have in an office environment. And aside from making people look sallow, fluorescent tubes sometimes emit an unpleasant buzzing sound. One quick solution is to outfit those fixtures with LED lights, which are easier on the eyes as well as your budget, since they consume less energy. 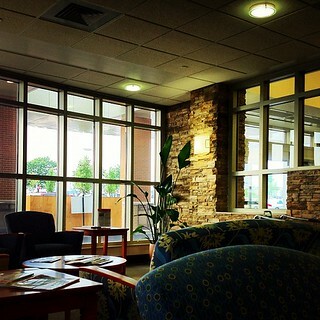 If you don’t have a window in your lobby, consider installing a skylight to bring natural light into the space. Or use a few artistic lamps to create a warm, cozy feel. The more comfortable your guests are, the less concerned they’ll be about waiting a few minutes. Many businesses have flat-screen TVs in lobbies, but then you have to decide what channel you should select to keep customers entertained without offending them. A better use of that TV is to showcase slides of your employees, projects you’ve done or interesting facts about your company. Or, scrap the TV altogether and add an aquarium with colorful fish. Even though the customer is always right, some of them may need a gentle reminder about etiquette. Somewhere in plain view, post a sign that pleasantly requests visitors not use cellphones in the lobby. Most of your guests will sincerely appreciate not having to hear loud conversations while they wait. No matter how you furnish your lobby, remember that the demeanor of the person at the front desk accounts for a large part of whether a visitor develops a favorable or negative impression of your business. Never underestimate the power of a friendly smile.